Nitrofurantoin, sold under the trade name Macrobid among others, is an antibiotic used to treat bladder infections. It is not effective for kidney infections. It is taken by mouth. Common side effects include nausea, loss of appetite, diarrhea, and headaches. Rarely numbness, lung problems, or liver problems may occur. It should not be used in people with kidney problems. While it looks like it is generally safe during pregnancy it should not be used near delivery. It works by slowing growth rather than killing bacteria. Nitrofurantoin was first sold in 1953. It is on the World Health Organization's List of Essential Medicines, the most important medications needed in a basic health system. It is available as a generic medication. The wholesale cost in the developing world is between 0.005 and 0.46 USD a dose. In the United States it is about 60 USD for 10 days of treatment. Current uses include the treatment of uncomplicated urinary tract infections (UTIs) and prophylaxis against UTIs in people prone to recurrent UTIs. Increasing bacterial antibiotic resistance to other commonly used agents, such as fluoroquinolones and trimethoprim/sulfamethoxazole, has led to increased interest in using nitrofurantoin. Several trials comparing nitrofurantoin to other commonly used agents have shown this drug results in similar cure rates for uncomplicated UTIs. The efficacy of nitrofurantoin in treating UTIs combined with a low rate of bacterial resistance to this agent makes it one of the first-line agents for treating uncomplicated UTIs as recommended by the Infectious Diseases Society of America and the European Society for Microbiology and Infectious Diseases. Nitrofurantoin is not recommended for the treatment of pyelonephritis, prostatitis and intra-abdominal abscess, because of extremely poor tissue penetration and low blood levels. It is used in the treatment of infections caused by these organisms. Antibiotic susceptibility testing should always be performed to further elucidate the resistance profile of the particular strain of bacteria causing infection. Nitrofurantoin is pregnancy category B. It is one of the few drugs commonly used in pregnancy to treat UTIs. Other drugs used for UTIs in pregnancy include cephalexin, amoxicillin, and pivmecillinam. The drug should not be given to women in late pregnancy due to the potential risk of hemolytic anemia in the newborn, as the newborn has not yet developed the enzymatic pathways necessary for glutathione metabolism and the drug may cause oxidative damage to the red blood cells. Newborns of women given this drug late in pregnancy had a higher risk of developing neonatal jaundice. Several trials on the safety and teratogenicity of nitrofurantoin in pregnancy have shown mixed results. A retrospective study in 2009 claimed that several birth defects, such as hypoplastic left heart syndrome, ophthalmic malformations, cleft lip and cleft palate, and atrial septal defect, were more common in neonates exposed to nitrofurantoin during pregnancy. A meta analysis of four out of twenty-two available studies on the safety of nitrofurantoin found no increased risk. A case-control study in 1998 found an increased risk of craniosynostosis after exposure to "nitrosatable" drugs. A more recent 2013 population-based cohort study which used women registered in the Norwegian Prescription Database and linked the subjects to a birth outcomes database, however, found no increased risk of major malformations in neonates born to women who took nitrofurantoin in early pregnancy. Many of the studies showing increased risk of nitrofurantoin had limitations and relied on patients' recall of the antibiotics they took during pregnancy rather than objective data, which may have led to recall bias. Nevertheless, in light of these conflicting data, the American College of Obstetrics and Gynecology (ACOG) recommends using antibiotics only for appropriate indications and for the shortest effective duration. Patients should be informed that nitrofurantoin colours urine brown; this is completely harmless. Some of the more serious but rare side effects of nitrofurantoin have been a cause of concern. These include pulmonary reactions, hepatotoxicity, and neuropathy. The pulmonary toxicity caused by nitrofurantoin can be categorized into acute, subacute, and chronic pulmonary reactions. The acute and subacute reactions are thought to be due to a hypersensitivity reaction and often resolve when the drug is discontinued. Acute reactions have been estimated to occur in about one in 5000 women who take the drug. These reactions usually develop 3–8 days after the first dose of nitrofurantoin, but may occur from a few hours to a few weeks after starting the drug. Symptoms include fever, dyspnea, chills, cough, pleuritic chest pain, headache, back pain, and epigastric pain. Chest radiograph will often show unilateral or bilateral infiltrates similar to pulmonary edema. Treatment includes discontinuation of the nitrofurantoin, which should result in symptom improvement within 24 hours. Chronic pulmonary reactions caused by nitrofurantoin include diffuse interstitial pneumonitis, pulmonary fibrosis, or both. This uncommon reaction may occur 1 month to 6 years after starting the drug and is usually related to its total lifetime dose. This reaction manifests with progressive shortness of breath. It is important to recognize nitrofurantoin as possible cause of symptoms and discontinue the drug when the suspicion of pulmonary side effects arises as it can be reversible if the drug is stopped early. Hepatic reactions, including hepatitis, cholestatic jaundice, chronic active hepatitis, and hepatic necrosis, occur rarely. The onset of chronic active hepatitis may be insidious, and patients should be monitored periodically for changes in biochemical tests that would indicate liver injury. These reactions usually occur after exposure to the drug for more than 6 weeks. If signs of liver failure are observed in a patient taking nitrofurantoin, the drug should be discontinued. Re-challenge with the drug at a later date is not recommended, as the reaction may have a hypersensitivity component and recur when the drug is resumed. Neuropathy is a rare side effect of taking nitrofurantoin. Patients may experience numbness and tingling in a stocking-glove pattern, which may or may not improve upon discontinuation of the drug. Nitrofurantoin is contraindicated in patients with decreased renal function (CrCl < 60 ml/min) due to systemic accumulation and subtherapeutic levels reached in the urinary tract. However, a retrospective chart review suggests the data for this cutoff are slim and a cutoff of CrCl < 40 ml/min would be more appropriate. Many of the severe side effects of this drug are more common in the elderly and those with renal impairment, as this causes the drug to be retained in the body and reach higher systemic levels. Thus, the drug is not recommended for the elderly population according to 2012 AGS Beers criteria. Nitrofurantoin is also contraindicated in babies up to the age of one month, as they have immature enzyme systems in their red blood cells (glutathione instability), so nitrofurantoin must not be used because it can cause haemolytic anaemia. For the same reason, nitrofurantoin should not be given to pregnant women after 38 weeks of pregnancy. Nitrofurantoin is contraindicated in patients with glucose-6-phosphate dehydrogenase deficiency because of risk of intravascular hemolysis resulting in anemia. Organisms are said to be susceptible to nitrofurantoin if their minimum inhibitory concentration is 32 μg/ml or less. The peak blood concentration of nitrofurantoin following an oral dose of nitrofurantoin 100 mg, is less than 1 μg/ml and may be undetectable. Its bioavailability is about 90% and the urinary excretion is 40% tissue penetration is negligible; the drug is well concentrated in the urine: 75% of the dose is rapidly metabolised by the liver, but 25% of the dose is excreted in the urine unchanged, reliably achieving levels of 200 μg/ml or more. In studies of dogs, the majority of urinary excretion is through glomerular filtration with some tubular secretion. There is also tubular absorption which is increased with urine acidification. However the activity of nitrofurantoin is also pH depenent and mean inhibitory concentration rises sharply with increased pH above 6. Nitrofurantoin cannot be used to treat infections other than simple cystitis. At the concentrations achieved in urine (>100 μg/ml), nitrofurantoin is a bactericide. It is bacteriostatic against most susceptible organisms at concentrations less than 32 μg/ml. Nitrofurantoin and the quinolone antibiotics are mutually antagonistic in vitro. It is not known whether this is of clinical significance, but the combination should be avoided. Resistance to nitrofurantoin may be chromosomal or plasmid-mediated and involves inhibition of nitrofuran reductase. Acquired resistance in E. coli continues to be rare. Nitrofurantoin and its metabolites are excreted mainly by the kidneys. In renal impairment, the concentration achieved in urine may be subtherapeutic. Nitrofurantoin should not be used in patients with a creatinine clearance of 60 ml/min or less. However, a retrospective chart review may suggest nitrofurantoin is not contraindicated in this population. Nitrofurantoin is concentrated in the urine, leading to higher and more effective levels in the urinary tract than in other tissues or compartments. With a 100 mg oral dose, plasma levels are typically less than 1µg/ml while in the urine it reaches 200 µg/ml. The mechanism of action is unique and complex. The drug works by damaging bacterial DNA, since its reduced form is highly reactive. This is made possible by the rapid reduction of nitrofurantoin inside the bacterial cell by flavoproteins (nitrofuran reductase) to multiple reactive intermediates that attack ribosomal proteins, DNA, respiration, pyruvate metabolism and other macromolecules within the cell. Nitrofurantoin exerts greater effects on bacterial cells than mammalian cells because bacterial cells activate the drug more rapidly. It is not known which of the actions of nitrofurantoin is primarily responsible for its bactericidal activity. The broad mechanism of action for this drug likely is responsible for the low development of resistance to its effects, as the drug affects many different processes important to the bacterial cell. Nitrofurantoin has been available for the treatment of lower urinary tract infections (UTIs) since 1953. Residues from the breakdown of nitrofuran veterinary antibiotics, including nitrofurantoin, have been found in chicken in Vietnam, China, Brazil, and Thailand. The European Union banned the use of nitrofurans in food producing animals by classifying it in ANNEX IV (list of pharmacologically active substances for which no maximum residue limits can be fixed) of the Council Regulation 2377/90. 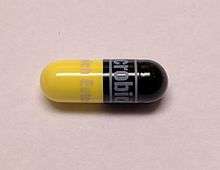 The Food and Drug Administration (FDA) of the United States has prohibited furaltadone since February 1985 and withdrew the approval for the other nitrofuran drugs (except some topical uses) in January 1992. The topical use of furazolidone and nitrofurazone was prohibited in 2002. Australia prohibited the use of nitrofurans in food production in 1992. Japan did not allocate MRLs for nitrofurans leading to the implementation of a "zero tolerance or no residue standard". In Thailand, the Ministry of Health issued in 2001 Proclamation No. 231 MRL of veterinary drug in food which did not allocate MRL for nitrofurans. The Ministry of Agriculture and Cooperatives had already prohibited importation and use of furazolidone and nitrofurazone in animal feed in 1999 which was extended to all nitrofurans in 2002. Several metabolites of nitrofurans, such as furazolidone, furaltadone and nitrofurazone cause cancer or genetic damage in rats. It is available as a generic medication. The wholesale cost is 0.005 and 0.46 USD a dose. In the United States 60 USD for 10 days of treatment. Nitrofurantoin is marketed under many names in countries worldwide. 1 2 3 4 5 6 7 8 9 "Nitrofurantoin". The American Society of Health-System Pharmacists. Retrieved Aug 1, 2015. 1 2 Blass, Benjamin (2015). Basic Principles of Drug Discovery and Development. Elsevier. p. 511. ISBN 9780124115255. 1 2 "Nitrofurantoin". International Drug Price Indicator Guide. Retrieved 31 August 2015. 1 2 3 4 5 6 7 8 9 10 11 12 "Macrobid Drug Label" (PDF). FDA. Retrieved 21 April 2014. ↑ Garau J (January 2008). "Other antimicrobials of interest in the era of extended-spectrum beta-lactamases: fosfomycin, nitrofurantoin and tigecycline". Clin. Microbiol. Infect. 14 Suppl 1: 198–202. doi:10.1111/j.1469-0691.2007.01852.x. PMID 18154548. ↑ McKinnell, JA; Stollenwerk, NS; Jung, CW; Miller, LG (Jun 2011). "Nitrofurantoin compares favorably to recommended agents as empirical treatment of uncomplicated urinary tract infections in a decision and cost analysis.". Mayo Clinic Proceedings. 86 (6): 480–8. doi:10.4065/mcp.2010.0800. PMC 3104907 . PMID 21576512. ↑ Christiaens TC, De Meyere M, Verschraegen G, Peersman W, Heytens S, De Maeseneer JM (Sep 2002). "Randomised controlled trial of nitrofurantoin versus placebo in the treatment of uncomplicated urinary tract infection in adult women.". The British journal of general practice: the journal of the Royal College of General Practitioners. 52 (482): 729–34. PMC 1314413 . PMID 12236276. ↑ Gupta, K; Hooton, TM; Roberts, PL; Stamm, WE (Nov 12, 2007). "Short-course nitrofurantoin for the treatment of acute uncomplicated cystitis in women.". Archives of Internal Medicine. 167 (20): 2207–12. doi:10.1001/archinte.167.20.2207. PMID 17998493. ↑ Iravani, A; Klimberg, I; Briefer, C; Munera, C; Kowalsky, SF; Echols, RM (Mar 1999). "A trial comparing low-dose, short-course ciprofloxacin and standard 7-day therapy with co-trimoxazole or nitrofurantoin in the treatment of uncomplicated urinary tract infection.". The Journal of antimicrobial chemotherapy. 43 Suppl A: 67–75. doi:10.1093/jac/43.suppl_1.67. PMID 10225575. ↑ Stein, GE (Nov 1999). "Comparison of single-dose fosfomycin and a 7-day course of nitrofurantoin in female patients with uncomplicated urinary tract infection.". Clinical therapeutics. 21 (11): 1864–72. doi:10.1016/S0149-2918(00)86734-X. PMID 10890258. 1 2 Gupta, K.; Hooton, T. M.; Naber, K. G.; Wullt, B.; Colgan, R.; Miller, L. G.; Moran, G. J.; Nicolle, L. E.; Raz, R.; Schaeffer, A. J.; Soper, D. E. (2011). "International Clinical Practice Guidelines for the Treatment of Acute Uncomplicated Cystitis and Pyelonephritis in Women: A 2010 Update by the Infectious Diseases Society of America and the European Society for Microbiology and Infectious Diseases". Clinical Infectious Diseases. 52 (5): e103–e120. doi:10.1093/cid/ciq257. PMID 21292654. ↑ Lipsky, Benjamin A.; Byren, Ivor; Hoey, Christopher T. "Treatment of Bacterial Prostatitis". Clinical Infectious Diseases. 50 (12): 1641–1652. doi:10.1086/652861. ↑ Solomkin JS, Mazuski JE, Bradley JS, Rodvold KA, Goldstein EJ, Baron EJ, O'Neill PJ, Chow AW, Dellinger EP, Eachempati SR, Gorbach S, Hilfiker M, May AK, Nathens AB, Sawyer RG, Bartlett JG (January 2010). "Diagnosis and Management of Complicated Intra‐abdominal Infection in Adults and Children: Guidelines by the Surgical Infection Society and the Infectious Diseases Society of America". Clinical Infectious Diseases. 50 (2): 133–164. doi:10.1086/649554. PMID 20034345. 1 2 Gupta, K; Scholes, D; Stamm, WE (Feb 24, 1999). "Increasing prevalence of antimicrobial resistance among uropathogens causing acute uncomplicated cystitis in women.". JAMA: the Journal of the American Medical Association. 281 (8): 736–8. doi:10.1001/jama.281.8.736. PMID 10052444. ↑ Lee M, Bozzo P, Einarson A, Koren G (June 2008). "Urinary tract infections in pregnancy". Can Fam Physician. 54 (6): 853–4. PMC 2426978 . PMID 18556490. 1 2 Nordeng, H; Lupattelli, A; Romøren, M; Koren, G (Feb 2013). "Neonatal outcomes after gestational exposure to nitrofurantoin.". Obstetrics and gynecology. 121 (2 Pt 1): 306–13. doi:10.1097/AOG.0b013e31827c5f88. PMID 23344280. ↑ Crider, KS; Cleves, MA; Reefhuis, J; Berry, RJ; Hobbs, CA; Hu, DJ (Nov 2009). "Antibacterial medication use during pregnancy and risk of birth defects: National Birth Defects Prevention Study.". Archives of pediatrics & adolescent medicine. 163 (11): 978–85. doi:10.1001/archpediatrics.2009.188. PMID 19884587. ↑ Ben David S, Einarson T, Ben David Y, Nulman I, Pastuszak A, Koren G (1995). "The safety of nitrofurantoin during the first trimester of pregnancy: meta-analysis.". Fundamental & clinical pharmacology. 9 (5): 503–7. doi:10.1111/j.1472-8206.1995.tb00525.x. PMID 8617414. ↑ Gardner, JS; Guyard-Boileau, B; Alderman, BW; Fernbach, SK; Greene, C; Mangione, EJ (Feb 1998). "Maternal exposure to prescription and non-prescription pharmaceuticals or drugs of abuse and risk of craniosynostosis.". International Journal of Epidemiology. 27 (1): 64–7. doi:10.1093/ije/27.1.64. PMID 9563695. ↑ American College of Obstetricians and Gynecologists Committee on Obstetric Practice (Jun 2011). "ACOG Committee Opinion No. 494: Sulfonamides, nitrofurantoin, and risk of birth defects.". Obstetrics and gynecology. 117 (6): 1484–5. doi:10.1097/AOG.0b013e3182238c57. PMID 21606771. ↑ Jick, S S; Jick, H; Walker, A M; Hunter, J R (1989-09-01). "Hospitalizations for pulmonary reactions following nitrofurantoin use.". Chest. 96 (3): 512–515. doi:10.1378/chest.96.3.512. ISSN 0012-3692. 1 2 3 Huttner, Angela; Verhaegh, Els M.; Harbarth, Stephan; Muller, Anouk E.; Theuretzbacher, Ursula; Mouton, Johan W. (2015-09-01). "Nitrofurantoin revisited: a systematic review and meta-analysis of controlled trials". Journal of Antimicrobial Chemotherapy. 70 (9): 2456–2464. doi:10.1093/jac/dkv147. ISSN 0305-7453. PMID 26066581. ↑ Williams, EM; Triller, DM (May 2006). "Recurrent acute nitrofurantoin-induced pulmonary toxicity.". Pharmacotherapy. 26 (5): 713–8. doi:10.1592/phco.26.5.713. PMID 16718946. ↑ Amit, G; Cohen, P; Ackerman, Z (Mar 2002). "Nitrofurantoin-induced chronic active hepatitis.". The Israel Medical Association journal : IMAJ. 4 (3): 184–6. PMID 11908259. ↑ Tan, IL; Polydefkis, MJ; Ebenezer, GJ; Hauer, P; McArthur, JC (February 2012). "Peripheral nerve toxic effects of nitrofurantoin". Archives of neurology. 69 (2): 265–8. doi:10.1001/archneurol.2011.1120. PMID 22332195. ↑ Oplinger, M; Andrews, CO (Jan 2013). "Nitrofurantoin contraindication in patients with a creatinine clearance below 60 mL/min: looking for the evidence". The Annals of pharmacotherapy. 47 (1): 106–11. doi:10.1345/aph.1R352. PMID 23341159. 1 2 3 Shah (1989). "Reappraisal of the risk/benefit of nitrofurantoin: review of toxicity and efficacy". Adverse Drug Reactions and Acute Poisoning Reviews. 8: 183–201. PMID 2694823. ↑ McCalla DR, Kaiser C, Green MH (1978). "Genetics of nitrofurazone resistance in Escherichia coli". J Bacteriol. 133: 10–16. ↑ Bains A, Buna D, Hoag NA (2009). "A retrospective review assessing the efficacy and safety of nitrofurantoin in renal impairment". Canadian Pharmacists Journal. 142 (5): 248–252. doi:10.3821/1913-701X-142.5.248. ↑ Blass, Benjamin. Basic Principles of Drug Discovery and Development. p. 513. ISBN 9780124115255. ↑ Tu Y, McCalla DR (1975). "Effect of activated nitrofurans on DNA,". Biochem Biophys Acta. 402: 142–49.